While finally many of you are happy that the chilly winter nights are over and making plans to enjoy spring and summer we actually are grieving for the same. Though spring is considered to be the best time of the year but in our part of the world its not. Spring for us means very dry hot weather where the temperature fluctuates many folds between day and night. The evenings are actually soothing with gentle breeze but the mosquitos make it impossible to go out and enjoy that. As a student I used to love this season as this called for the biggest festival of Santiniketan ‘the Basanto utsav’. But these days all I can worry about the virus borne disease, including the most dreaded one, the chicken pox. What a metamorphosis…Sigh!!! The worst part is the lightness in the air gives rise to all air borne virus and everyone around us seems to be sneezing and coughing endlessly. Also loss of appetite is another thing to deal with. All we want to have is something light and refreshing which will replenish the loss of water, shield us against disease and revive our appetite. 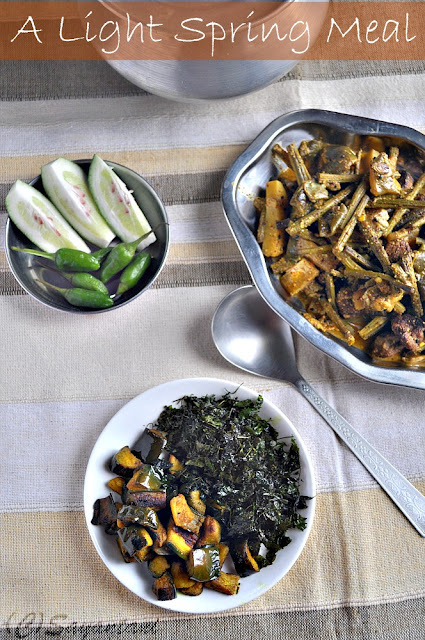 this light meal of Neem begun ( Crispy fried tender leaves of neem and fried eggplant) and shojne data charchari (drumstick curry) is just what we all want right now. From ancient days Neem or Azadirachta indica has always been known to have antibacterial, anti-fungal, anti pox and ant-inflammatory properties. According to Ayurveda Neem seems to have a certain level of curative capability for almost all diseases. Each and every part of this wonderful tree is used widely in ayurvedic medicines. and during spring time it’s a joy to watch the new tender reddish leaves sprout and glow in the clear sunshine. 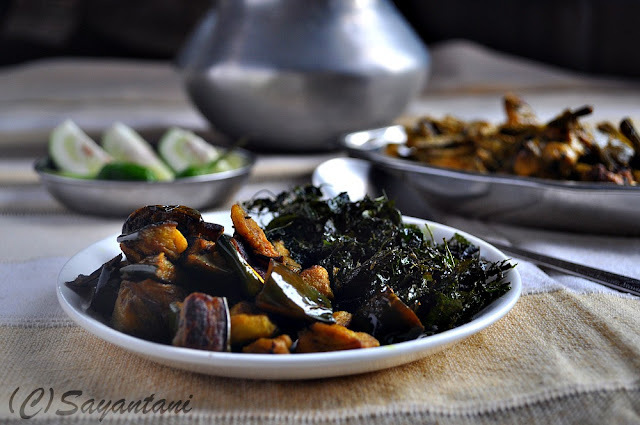 We Bengalis collect these tender leaves and crispy fry it along with aubergine and eat mixed with rice to get rid of any impurities in our body. We believe any bitter first course will cleanse our palette and enhance our appetite. similarly drumsticks that grow in abundance during this season is said to have anti pox qualities for which we eat a lot of the tender leaves, flowers and fruits of the drumstick trees. 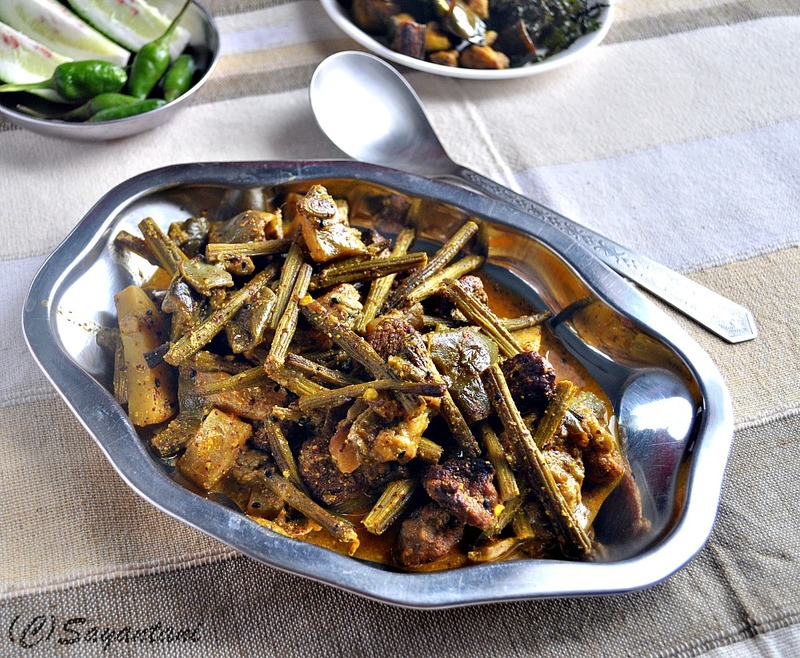 This dry drumstick dish is cooked with various other vegetables like aubergine, broad bean, radish and potato in a hot pungent mustard based gravy. There’s no better way to prepare your body for the scorching summer than having these seasonal vegetables. Trust me its tasty too as my soon to be 3 years old son enjoys his meal without puckering his face a lil bit. Between if you want to take the cleansing and detoxifying idea more seriously then let me share with you another piece of information. As per ayurveda this time of the year is best to aim for a total cleansing of your body through a cleansing diet. Want to know more? See Here. Pick, clean and wash the leaves and chop roughly. Wash and cut the eggplant in small (1/2”) squares. Place them in a large bowl. Fill the bowl with water and place a big bowl on top to submerge the cubed eggplants. Let it stand like this for 10 minutes. also while making this dish eggplants are always fried first so that it doesnot take up the bitter taste. 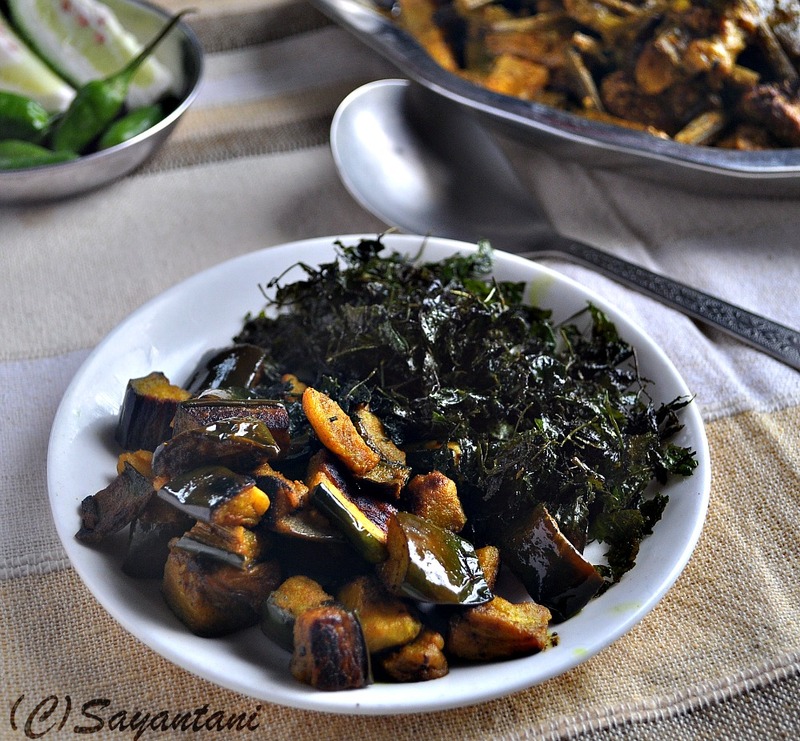 Heat the 1 tsp oil and fry the cubed eggplants with salt and turmeric. Keep on stirring so that it doesnot stick to the bottom. It will be cooked within 5 minutes. Once the eggplants are soft and cooked thoroughly take out in a bowl. In the same pan add the chopped neem leaves. Sprinkle little salt and fry on low heat. In the beginning the leaves will release a lot of juice. Let it dry up naturally and then keep stirring and cooking it. Once they are lightly crisp and dry (approx. 5-7 minutes) pour the ½ tsp oil and stir continuously to cook it. Within 2 minutes it would be crisp and dry. Take out and serve along with fried eggplant and steamed rice. Updated on 13th March'12: to eat mix 2 tbsp of fried eggplant with 1 tsp of fried neem leaves with rice. tender neem leaves are not as bitter as the matured leaves. eating this with rice and eggplant also help in reducing the bitter taste. Charchari is a Bengali style of cooking where the vegetables are first fried and charred on a low flame and then cooked with mustard based gravy. Chop off the ends, peel and cut the drumsticks in 2” pieces. Wash and keep aside. Wash the potato under running water and cut in thick wedges like French fries. Cut the radish and eggplant in similar manner. Trim the broad beans and cut in small pieces. Heat 1 tbsp oil in a kadai or wok. Fry the wadi on low heat till golden and crisp. Drain and keep aside. Pour the rest of the oil and heat it. Rub the nigella seeds in your palm and add to the oil along with slit green chillies. When they splutter add the drumsticks, radish and broad beans. Mix salt and turmeric and keep cooking on medium flame. When the veggies are little soft (4-5 minutes) add the rest of the vegetables and stir to mix. Cover and let it cook. When the vegetables become dry and tender add the mustard paste and stir to coat it well. Do this on low flame or it will burn at the bottom. Cook for a couple of minutes and then pour ¾ cup water. Cover and let it simmer. The vegetables should be tender (but not mushy) by the time the water is almost absorbed. Add in the fried bori, a pinch of sugar and mix. Cook for a minute and take off from heat. The dish dhould not be very dry rather coating gravy should be there. Please adjust the water accordingly. If you plan to make the drumstick dish with not so fresh and juicy sticks (mostly the super market varieties) then cut them and place in a bowl of cold water for 15 minutes. This will do the trick and will freshen it up. You can also use a mixture of mustard and poppy seeds paste. Please adjust the number of chillies as per your heat quotient. Red chili powder could also be added for extra colour. I love to crush whole red chili with mustard but now that my son also eats this I prefer to stay away from much heat. you can also use panchforon instead of nigella seeds. 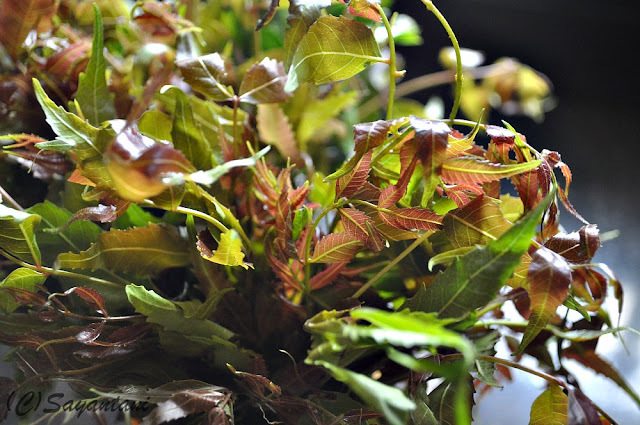 If the neem leaves are dry roasted then it could be stored in an air tight container for several days which I mostly do. Saves time. sending these to let's cook greens at Tickling palettes. cooking concepts:vegan diet at Srav's culinary concepts. I also wish you a very happy and colourful Holi. Be happy, be safe!!! 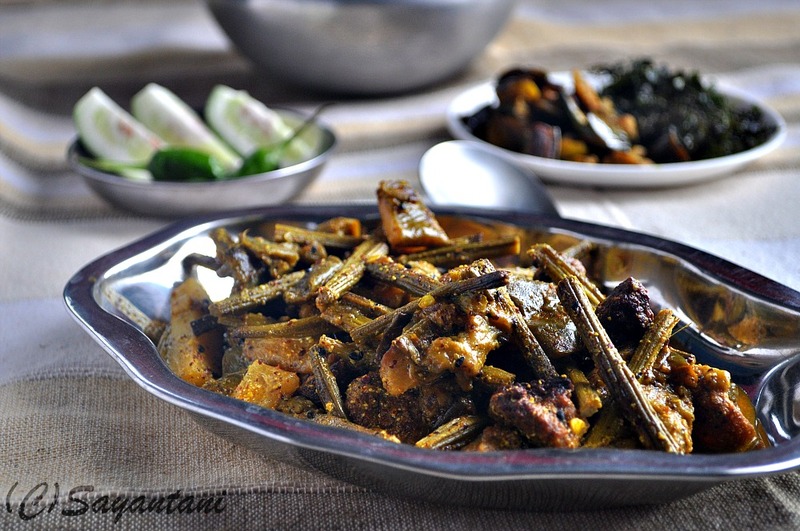 neem pata bhaja, neem begun recipe, nim pata tarkari, what to cook with neem leaves, neem leaves for system cleansing, neem for detox diet, bengali neem recipes, sojne danta, danta, danta charchari, sojina chprchori, chachadi recipe, how to cook charchari, bengali mustard based vegetable recipe, how to cook drumstick with bengali spices, bengali five spice, sorsher tarkari, pure vegetarian recipes, vegan drumstick recipe, spring recipes, begun bhaja, fried egg plant, bengali style fried aubergine. Totally different one. Looks nice and informative for me. Authentic Bengali cuisine, all the dishes are totally new to me and awesome..
A very healthy and nutritious platter. Wish you a very Happy Holi. I would give anything for that bowl of sajana charchari... I love it with mustard paste too! WOnderful post, sounds too good! Wow...that's a very lovely post.I loved the entire recipe so much that I have been staring to the screen for long..Yummy ! Happy Basant utsav Sayantani! Stay safe. Neem in a sabzi is a shock for me, but knowing Indian cooking I understand the ayurvedic basis of including it in the meal. I think a chef mentioned the tender neem leaves to me, he was Bengali. Either that or something with bittergourd leaves or vines - I can't remember now - do you make something with that? Everything in this post looks exotic to me and I think this is one of the rare times I've seen drumstick being used outside South Indian cooking. very informative!...... different recipes.....nice n healthy. Lovely dish! Clicks are awesome! Happy Holi to you! The meal looks absolutely scrumptious and comforting. New to me,looks super yummy and healthy. oh wow, it all sounds so exotic to me... never cooked neem leaves before, so healthy! Oh..I love those tender leaves of neem in your picture..so full of life! And this certainly is a unique dish for me. charchari I have had, not this variety though, love it. Neem begun is very new to me, sounds superb. Gal just read about your previous posts too..Glad to hear about the cooking trial :) How was your vacation? I have got an event going on for kids, wanna jump in? This is new to me totally and sounds very good too! Are you really sure the neems leaves in Nim Begun are not really bitter? I have access to tender neem leaves but i don't even eat bitter gourd. While i am tempted to try this, i am also apprehensive at the same time. The drumstick curry on the other hand, i love that. It has been ages...so many years back that I tasted neem:( Thanks for posting this informative recipe..loved it. Dear Sayantani, you've been one of my first introducers to Bengali food and love your presentation style and a great blog that you have. Your dry dish with vegetable peels and mushroom soup are a big hit in my house. I have tagged you at my blog, and please do take it up if you can. Cheers! I tried the sojne data chocchori, it was delicious. Thank you for posting the recipe!